Here on amacaday, I want you to learn more than great recipes. I want you to know why you’re eating what you’re eating, or in this case, drinking. The phrase “you are what you eat” comes to mind here. Lots of food blogs out there focus on awesome photos and delicious recipes, but, here, you’re going to get a bit of education as well (nerd alert!). With that said, I’m going to start implementing “Why Wednesdays”. Life’s too short to eat without purpose and reason. That’s not to say that we shouldn’t enjoy what we eat, but I want you to eat things that are not only pleasing to the tongue, but that your whole body can feel good about. Food is the fuel to your body’s engine. Let’s fill up more on premium and less on unleaded. Last week I posted a recipe for homemade almond milk. Have you tried it yet? You’ll be amazed at how easy it is and how lovely the results are. The question I think a lot of people are asking, though, is what’s wrong with regular milk? And which is the best milk alternative? Let’s discuss first why so many people are shying away from cow’s milk. There are lots of arguments out there for why not to drink cow’s milk. Many will say cow’s milk is for calves, just like breast milk is for babies. You’ll hear a lot that humans are the only living beings that drink the milk of another animal. It’s true. Cow’s milk provides a lot of great nutrients, but unless you’re getting your milk from a farmer you trust and your milk is raw, there may be lots of stuff in your milk you don’t want. I could go into the environmental tirade of the fair treatment of animals, the amount of waste cow’s produce, the food processing industry in general, but, I’m not going to here. You can read up on that on your own. I’m not saying I don’t still eat cheese and the occasional ice cream cone, but I’ve cut back on my milk consumption a lot. For some people, avoiding milk is out of necessity. Worldwide, about 65% of people have some sort of lactose intolerance. This percentage varies in different parts of the world; for instance, in Asian countries, the percentage is around 90%, whereas parts of Europe and North America are as low as 5%. The amount of children with dairy allergies has been on the rise in the last 10 years as well. Lactose intolerance can be seen in varied degrees of severity. Some people may not know that their health issues are actually related to milk and dairy products. Beyond being lactose intolerant, some people avoid milk because of its sugar level and also its level of acidity. 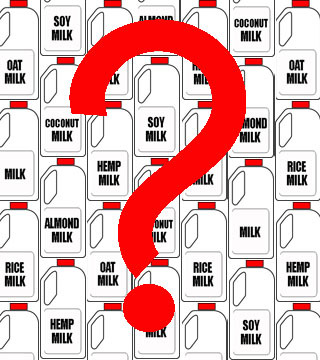 All of these issues can be solved by choosing a milk alternative. 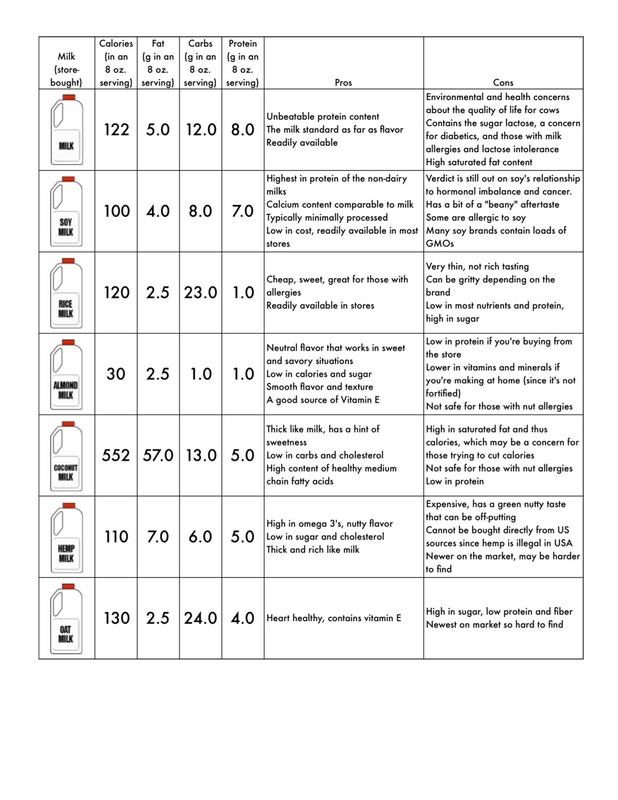 I’ve created a chart of the most common milk alternatives available in the grocery store today. Choosing the best option for you is really based on what you want out of milk — if you are looking for protein, you may choose cow’s milk or soy, but if you’re looking for something low in sugar and calories, you may choose almond milk. The bigger picture to think about is why you need to make milk a part of your diet. If you think you should be drinking milk for the calcium, you absorb more from leafy greens than you do from milk. Even dairy-free milk substitues shouldn’t be added to your life to necessarily boost it nutritionally. These are more here for if you absolutely need milk as part of a recipe or you’re really craving drinking a glass. At the end of the day, none of these milks offer anywhere near as many good things for you as other foods. I typically keep milk around for dairy-like smoothies, the occasional oatmeal or cereal in the morning, or sometimes to add to a creamy dish. Every once in a while I just want a glass to accompany something sweet or rich. If you do desire to continue having a milk in your kitchen, making your own of any of these is the best way to go. The concept I introduced for almond milk could be used for any of the other milks above. If you are going to buy from the store, buying organic and non-GMO is always the best way to go. Select refrigerated over shelf-stable (ew, milk just sitting on your shelf??!?). Look for the ones with the fewest ingredients and choose unsweetened/plain. Hope this helps clear up the mystery of so many choices in the store and at home. This entry was posted in Uncategorized and tagged allergies, almond, almond milk, alternative, alternatives, chart, coconut, coconut milk, dairy, drink, gluten free, hemp, hemp milk, information, milk, milk allergy, milk substitute, nut allergy, nutrition, oat, oat milk, raw, rice milk, soy milk, soymilk, substitutes, vegan, vegetarian by Megan @ amacaday.com. Bookmark the permalink.